Kady Loveday, 12, of Bedlington was the winner of the prestigious Carl Hester Trophy at the Riding for the Disabled National Championships at Hartpury last weekend. Riding Mr Measles for the Newcastle and District Group, based near Mitford, Kady was first in Partially Visually Impaired Dressage with a high score of 79.4%. With this outstanding score Kady was the highest scoring rider of over 200 entries in any Championship Dressage class and was therefore awarded the Carl Hester Trophy. She also received the Dance Trophy for the highest scoring newcomer. Kady was accompanied by another visually impaired rider, Emma Hunter, who also did terrifically well being placed first in Combined Training and second in Countryside Challenge. 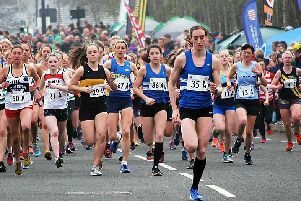 “We took two girls to the National Championships,” said Newcastle chairman Avril Lomas “and came home with two champions. The Carl Hester Trophy is awarded at each National Championships and was won in 2012 by Gayle Bloomfield, of the Morpeth Group. Kady’s success means twice in five years this top award has come to this corner of Northumberland.